ECDIS should present the Standard Display at any time by a single operator action. The SENC information that should be shown when a chart is first displayed on ECDIS. Depending upon the needs of the mariner, the level of the information it provides for route planning or route monitoring may be modified by the mariner. The level of SENC information which cannot be removed from the display, consisting of information which is required at all times in all geographic areas and all circumstances. It is not intended to be sufficient for safe navigation. When a chart is first displayed on ECDIS, it should provide the Standard Display at the largest scale available in the SENC for the displayed area. SENC information available for display during route planning and route monitoring should be subdivided into the following three categories, Display Base, Standard Display and All Other Information. The ENC and all updates to it should be displayed without any degradation of their information content. ECDIS should provide a method to ensure that the ENC and all updates to it have been correctly loaded into the SENC. To a speed and distance measuring device. ECDIS should be possible for the mariner to select a safety contour from the depth contours provided by the SENC. ECDIS should emphasize the safety contour over other contours on the display. ECDIS should be possible for the mariner to select a safety depth. ECDIS should emphasize soundings equal to or less than the safety depth whenever spot soundings are selected for display. It should always be possible to display the SENC in a “north-up” orientation. other orientations are permitted. ECDIS should provide for true motion mode. Other modes are permitted. The effective size of the chart presentation for route monitoring should be at least 270 mm by 270 mm. The chart information to be used in ECDIS should be the latest edition of that originated by a government authorized hydrographic office, and conform to IHO standards. The contents of the SENC should be adequate and up-to-date for the intended voyage to comply with regulation V/20 of the 1974 SOLAS Convention. It should not be possible to alter the contents of the ENC. Updates should be stored separately from the ENC. Radar information or other navigational information may be added to the ECDIS display. However, it should not degrade the SENC information and it should be clearly distinguishable from the SENC information. 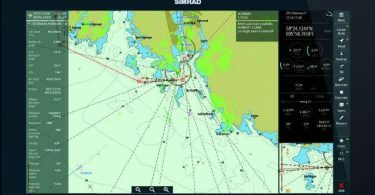 ECDIS and added navigational information should use a common reference system. If this is not the case, an indication should be provided. It should be possible to adjust a planned route by, for example: Adding waypoints to a route, Deleting waypoints from a route, Changing the position of a waypoint, Changing the order of the waypoints in the route. It should be possible to plan an alternate route in addition to the selected route. The selected route should be clearly distinguishable from the other. ECDIS should not degrade the performance of any equipment providing sensor inputs. Nor should the connection of optional equipment degrade the performance of ECDIS below this standard. ECDIS should be connected to systems providing continuous position fixing, heading and speed information. ECDIS should be provided with means for either automatically or manually carrying out on-board tests of major functions. In case of a failure, the test should display information to indicate which module is at fault. It should be possible to operate ECDIS and all equipment necessary for its normal functioning when supplied by an emergency source of electrical power in accordance with the appropriate requirements of chapter II-1 of the 1974 SOLAS Convention. Changing from one source of power supply to another or any interruption of the supply for a period of up to 45 seconds should not require the equipment to be manually re-initialized. What is ECDIS? & what are its advantages? What are the equipments carried in Lifeboat?